...who got baptized on Sunday evening. We are so happy and proud of him. It was a great service with wonderful speakers and another one of Damon's friends from church being baptized as well. After Damon's baptism we had everyone over for soups, presents, cake and ice cream. The cakes....thankfully Aunt Kelly was in town to help with (do all of) the cake decorating. We had a white cake for the Autobots and a Devil's Food cake for the Decpticons. Christmas started around 5:30am when the boys woke us up saying they weren't tired and ready to see what Santa brought. Being the mean parents we are, we made them go back to bed. So a few hours later, they actually got to see what Santa left. 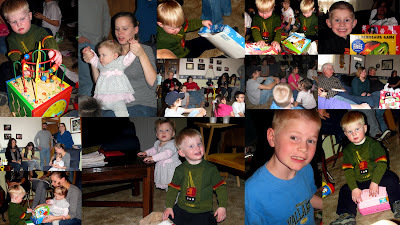 After seeing what Santa brought for us at our house, we headed over to the Littles to see what was left for us there. Except for Aiden, he didn't get his stocking until Saturday, he was still asleep when the boys got their's and didn't wake up until it was time to go. 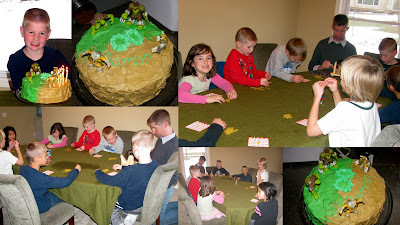 We had a great Christmas eating, playing games, watching Up, and lots of presents! Aiden loves anything that plays music, he would not stop dancing with his stocking. Normally we spend Christmas Eve with my parents but due to the insane and horrible weather we decided it would be smart to stay home this year. Since I didn't plan for dinner that night, we met up with Adam's parents and went to La Fiesta. Since Damon's birthday was last year he wanted the opportunity to wear the sombrero and be sung too. He loved it, even when the smirred the whipped cream all over his face. We will be back in June for Xavier's birthday, he has already asked five times. 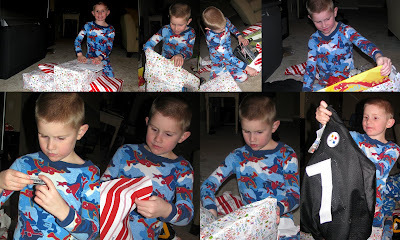 After we went back to the Littles and opened the traditional one present. 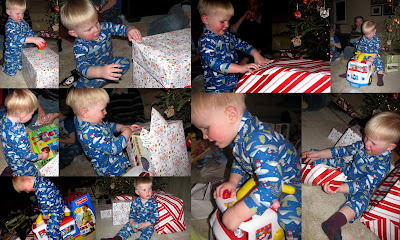 Damon and Xavier each got a Transformers book and Aiden got Thomas the Train underware. I got a cool flower picture for my kitchen and Adam got some hand lotion he has been wanting since he ran out of his last tube, he's my delicate flower. 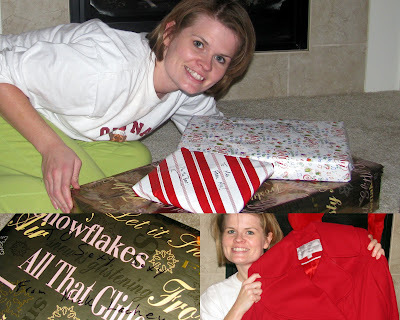 After we went back home and opened our Christmas presents and set out cookies and hot chocolate for Santa. 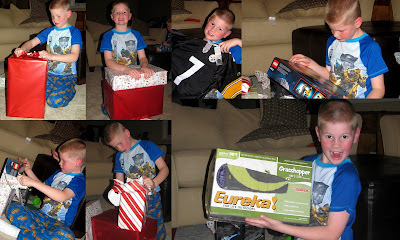 Damon got a Steelers jersey, remote control helicopter, sleeping bag and a lego set. He also got a gift card from Grandpa Dolezal. Xavier got a Steelers jersey, remote control helicopter. sleeping bag and Spike Jr dinosaur. He too got a gift card from Grandpa Dolezal. Aiden got a Steelers jersey, sleeping bag, a ice cream truck ride on toy and an Elmo lego set. He also got a gift card from Grandpa Dolezal. 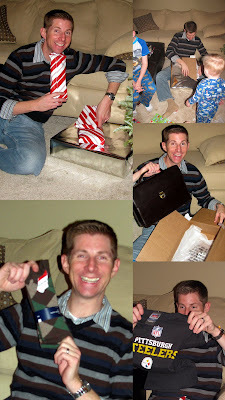 Adam got a Steelers shirt, dress socks, the new James Bond movie and a new briefcase for church. I got a Steelers shirt, a sweater and a fancy new dress coat. The boys for quite some time have wanted to go to Red Lobster for dinner. Adam and I are not big fans of RL, especially Adam since he hates everything that comes from the sea. So I decided it would be fun to take them while they are out of school for Winter Break. So Monday morning the 4 of us and Grandma and Grandpa Little drove to Topeka just to eat at Red Lobster. I warned the boys before hand that they will be having seafood and not chicken, hamburgers or mac and cheese. They decided to share a plate of fried shrimp and fried clams. They loved it. I hope this doesn't mean they will want to go back. They really liked seeing the lobsters in the front. Although I think they were a little sad when they noticed the small one they liked so much was gone after our lunch. Sunday we got together with my family for a Christmas celebration. We had snacks and got to hang out and talk with all but one of my siblings. It was a lot of fun. 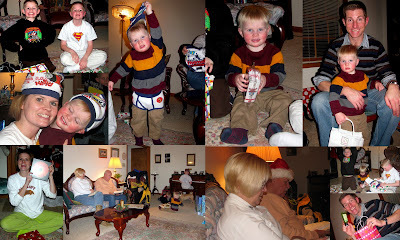 The boys loved the pjs they got from Grandma and Grandpa Prewit and they have been playing the games ever since. Aiden enjoyed playing with his cousin Riley who is just a year younger than him but the closest one to his age. 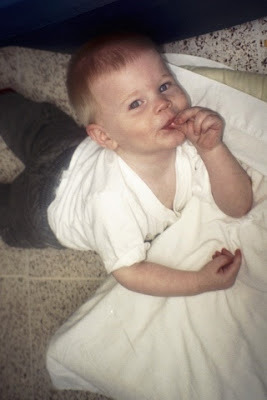 On the day of Damon's birthday I made sugar cookies for him to bring to his class and then that night we had a little celebration at home. I made him Chicken Enchiladea soup at his request and had ice cream for dessert. We let him open one present which were new dress clothes for his baptism next week. Grandma and Grandpa Little also came to bring him a book for him to fill out about his baptism. The next day, Damon had 5 friends over (2 from church and 3 from school) for pizza and bingo. Thanks to the Dollar Store each kid got 4 prizes. After bingo we had cake and ice cream. This was our first kid party to have at the house where we were completely in charge of everything, but I think it went really well. Damon had some nice little friends over that were really great, polite kids. One of the things that I love about our new house is the big window in the kitchen overlooks a lot of trees. So on a reuglar basis we can watch random little animals in the "wild." While I was baking a million and one Christmas cookies, I looked out and saw this little guy. Adam thinks I'm crazy for watching all of our little woodland animals. I even have a bird feeder, but I think we need more because all the food went really fast. The boys had their first piano recital on Saturday at the mall. Xavier played Jingles Bells and Damon played Go Tell on the Mountain. Yes Xavier is wearing gloves in all these pictures. On Thursday he got 1st degree frostbite on the tips of his fingers. The tips of them were white (scary!) and then once we got them warmed up they started to swell. Luckily no permanent damage was done and they are healed up now. His Dr wanted him to keep his gloves on to protect the skin since its similar to a burn. I would love to say that Xavier learned his lesson about dressing appropriately and not forgetting your gloves even after being reminded several times but I doubt that is the case. Especially since he tried to pick up the snow off the ground at the Dr's office and asked if he could go outside to play when we got home. Friday night was the church Christmas party/talent show. The members were treated to the talents of two very cute pianists and a Grandpa Little Duck song (he sang Rudolph the Red Nose Reindeer as Donald Duck). The boys were thrilled to meet Santa after the dinner and show. We had to wait a long time for our turn on Santa's lap but it was alllll worth it, that is until Damon has a meltdown over Santa not asking him what he wanted for Christmas. This is why are children go to bed at a certain time, less meltdowns. I think we will be watching it again since we were a little distracted. If you want to hear some inspiring Christmas messages, click here.